Method Schools combine online learning with projects and teachers who know each student’s needs. All Method students take online courses from FuelEd. Method teachers teach all online courses; the one exception is that FuelEd instructors teach the online second-year language courses. curriculum. Students in grades 6 through 12 use the FuelEd online courses. These courses include a variety of media, such as: videos, simulations, avatars and interactive graphics that enhance the instruction. 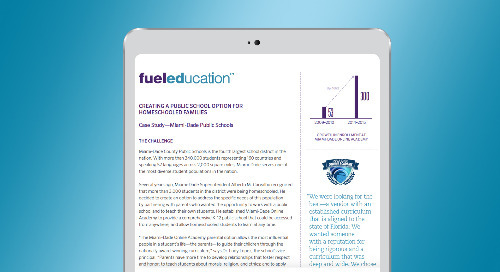 After only a year of implementation of FuelEd courses, math and reading scores increased exponentially and retention rate for the upcoming school year increased to 70%.